Christmas in Manchester. What could be more quaint and Christmassy than an ice-skating rink in scenic olde fashioned Piccadilly Gardens?. On Friday I snuck into the part that's right next to the rink so I could get better shots of the skaters (if the pictures come out okay I'll post them here later.) 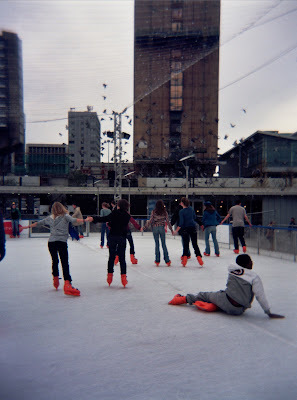 The first thing you notice is the enormous shocking orange plastic ice skates they make the punters wear. They make hockey skates look like Manolo Blahniks, and it's pretty much impossible to look cool in them. The skaters seemed to consist mainly of pre-teen kids who were mysteriously not in school. There were a lot of young girls skating around in aloof pairs, stopping frequently to reapply their frosted lip gloss or adjust their sparkly scarf and hat sets. But the best part was watching the scallies on ice, who behaved exactly the same way they do anywhere else. One little scallion in a red and blue tracksuit could really skate, and was playing havoc with the first-timers inching their way around the edges, skating the wrong way and buzzing them like a fighter plane. If you're looking to get in the Christmas spirit you may want to check out some of the city's christmas concerts. At St. Ann's Church they have a yule-related concert or carols service almost every day this month, including a special one just for lawyers (maybe they need extra help?) Most are free. And over at Manchester Cathedral there's also a whole mess of Christmas music happening, with Manchester Baroque doing Handel's Messiah on the 16th. One more thing: Avoid the St. Ann's Square Christmas markets on weekends at all costs unless you fancy waiting 40 minutes in the cold for a mug of glauwein and a lukewarm wurst. And if you've never been, a visitor from Nottinghamshire has a thorough write-up of this year's German Market here.